I learned of a new type of renewable energy this week, thanks to the town of Hastings, Minnesota. Hastings gets the distinction of having the United States' first commercial hydrokinetic power station. Hydrokinetic power is made by generating electricity from moving water, without the need for a dam. 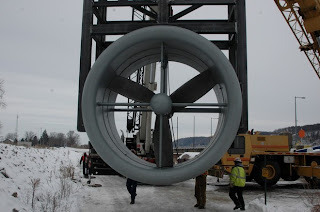 In this case, a turbine will be suspended from a barge on the Mississippi River. The turbine will hang about three feet below the river's surface and the current will turn the blades, which will power a generator and create about 100-200 kilowatts of electricity. Because this type of renewable energy uses the river's natural current rather than relying on the construction of a dam (as with hydropower), some are calling hydrokinetic energy "underwater wind power." The company building the station is Texas-based Hydro Green Energy. A spokesperson for the company said small-scale projects like the Hastings one can work in remote or rural communities where power demand isn't high but where there is a challenge in delivering power. Hydro Green Energy is also studying whether the turbine will harm the Mississippi's fish. Although this energy has been around for awhile, it's great to see that it's now possible on a commercial scale. Thanks for the information!